Are your natural stone bathroom or kitchen countertops starting to look a bit dull? Are you wondering what happened to your once gorgeous and reflective stone surfaces, that used to have the ability to dazzle anyone who saw them? It sounds like you are just in need of a little revamp! Natural stone, as gorgeous as it is, does require annual maintenance to maintain its attention-grabbing, gorgeous appearance! We recommend getting a deep professional cleaning done to your stone surface, and then to finish it off with a polish and seal! This will lock in the beauty of your natural stone counters, preserving their beauty and protecting your investment for years and years to come, because when stone is protected, it can last a lifetime! We seal natural stone to keep moisture and other materials from entering penetrating the stone and causing long-term damages to it. Natural stone is a porous material, meaning the surface is full of tiny holes which can lead deep below the surface. These holes serve as a vulnerability to the stone, allowing substances to enter and get trapped, which can lead to damage. In a bathroom or kitchen you are dealing with high humidity environments and many liquids, from cleaning, selfcare, or even cooking. This makes it even more important to protect your natural stone with a strong seal. 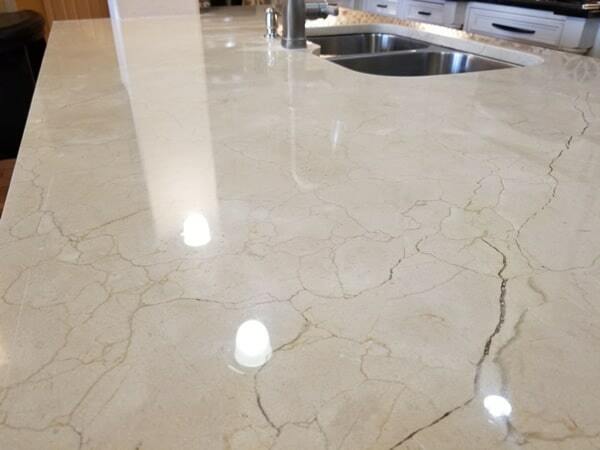 If you are looking for the extra dose of glitz and glamour that tends to go along with natural stone surfaces, you are looking for a high-quality polish! This will make your natural stone have a sleek and reflective surface that will be sure to capture the attention of all who see it. This is the traditional and most popular finish that we are accustomed to seeing on natural stone surfaces, counters and floors.